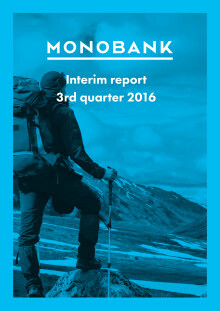 Monobank continues to progress and delivered its first positive quarterly result with a net profit of NOK 0.5 million after tax. The consumer finance bank has experienced strong demand for its loan and deposit products, and per September 2016, total loans amounted to NOK 624 million excluding prepaid agency commissions and unspecified loss provisions, an average increase of 34 per cent compared to second quarter 2016. This is slightly ahead of plan and demonstrates a controlled and sound growth strategy. The bank expect to be in the upper end of its guided range of NOK 750-800 million of loans outstanding per year-end 2016. The credit quality remain in line with projections. Deposits from customers amounted to NOK 638 million. Bank deposits and holdings liquid securities were NOK 138 million and total equity amounted to NOK 157 million. Third quarter net interest income was NOK 15.2 million, and the net interest margin was 6.4 per cent in the quarter. Marketing and operating cost were in line with budget. Loan provisions amounted to 4.2 per cent of loans in the quarter, and gross loans in default since the bank commenced regular banking operations was 3 per cent of average gross lending. To achieve operational synergies, diversify business model risk and strengthen the bank’s growth platform over time, the Board of Directors have decided to take the business abroad and commence banking operations with consumer loans in Finland in the first half of 2017. The bank has also entered into agreement with Widerøe’s Flyveselskap AS. A credit card will be offered to all Widerøe customers, and will allow credit card users to earn Eurobonus points through an agreement between the Bank, Widerøe and SAS Eurobonus. The card is expected to be launched towards the end of 2017. “We’re very pleased to be ahead of plan, and to see the first green numbers on the bottom line this quarter. Moreover, we are very excited to have entered into an agreement with such an attractive partner as Widerøe Flyveselskap on credit cards, an agreement that fits perfect with our multichannel approach. It will strengthen our position in the growing consumer finance market in Norway. In parallel, it is important for us to explore strategic growth opportunities within our market space. Monobank has established a highly scalable business and we are looking forward to launch in Finland in 2017”, said Bent H. Gjendem, Chief Executive Officer at Monobank. To support further domestic growth as well as funding the strategy for cross boarder and credit card expansion, the Board of directors decided to initiate an equity issue of NOK 175 million as well as an additional minor repair issue. 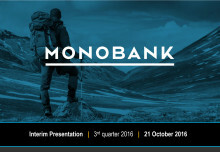 Monobank is an internet-based bank offering unsecured lending to qualified private individuals in Norway. Operations started out of Bergen, Norway, in November 2015 after received its banking licence from the Financial Supervisory Authority of Norway. The bank also offers attractive deposit rates on its savings accounts. Deposits up to NOK 2 million are guaranteed by the Norwegian Bank’s Guarantee fund, of which Monobank is a member.